Hi everyone! 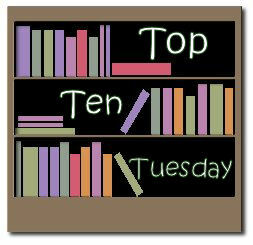 This week I wanted to do a Top Ten Tuesday in honor of Halloween, so I've picked out my top ten 10 spooky/creepy/scary books for the season. And, okay, some of them might not have actually scared me, but they are appropriate for Halloween. 1. Dracula by Bram Stoker: Gotta pay homage to the guy who made vampires scary and brought them into pop culture. Plus this book is pretty creepy, what with the dead coming back for the blood of the innocent and all. 2. Frankenstein by Mary Shelley: This is not so much scary as, again, a work that has influenced countless others. I would argue that this is the first real science fiction novel, though if you can think of an earlier one let me know! 3. In the Forest of Hands and Teeth by Carrie Ryan: I usually hate zombie anything, but this was so character-driven and the writing was so wonderful that I completely overlooked that. It was only afterward that I started to get the heebie jeebies, but it was totally worth it. Definitely a good Halloween-time book if you can handle the scary factor. 4. Life As We Knew It by Susan Beth Pfeffer: This is a different kind of scary: the end-of-the-world scary. No post-apocalyptic book has made me so grateful for the life I lead and that our moon is staying put. After putting this one down I had to remind myself that I didn't need to squirrel away incredible amounts of canned goods. 5. Sunshine by Robin McKinley: Not necessarily scary, but one of the best vampire books I've ever read, ever. And I've read a lot. But this is certainly for the more mature reader, and not little kids (language and sexual content and whatnot). But seriously, READ IT. 6. The Road by Cormac McCarthy: Again, the post-apocalyptic scariness. Add to this the cannibals roaming the land in search of any flesh, but mostly human. Terrifying to think about a world where there is no order except the strong turning against the weak... and eating them. 7. Coraline by Neil Gaiman: The button eyes! THE BUTTON EYES. It's creepy, but also, what an awesome character. Coraline rocks. 8. The Zombie Survival Guide and World War Z by Max Brooks: I admit, I didn't read these because of my fear of anything zombie. I did own them, but I got too scared to read them and just ended up donating them to my local library's book sale. 9. The Bailey School Kids series by Debbie Dadey and Marcia T. Jones: So yes, not scary. But so clever and fun! I love this series, and always will. Especially Werewolves Don't Go to Summer Camp, probably because I believe it was the first one I read. Yeah. Good luck getting to sleep tonight. What are your top ten scary books? Or just favorite ones to read near Halloween? REALLY?! Did you REALLY have to put that picture there?!!? Jeez. That picture is amazing! I have Frankenstein on my list too. I actually haven't read Dracula yet (but I recently bought a copy). Dr. Jekyll and Mr. Hyde is another classic horror, that I thoroughly enjoyed. The picture was frightening! I am reading The Forest of Hands and Teeth right now. I have to say, I LOVED The Bailey School Kids growing up, I'm glad to see them mentioned on your list! Very good list. It will be interesting to see the books everyone lists - I expect to find some new favourite scary books before the day is out. Great list! I don't read very many horror novels so I had a hard time with this one. Nice list! I have a few of these on my list as well and if you're afraid of zombies it's def a good thing you gave away World War Z before reading. I wouldn't normally say I'm afraid of zombies but I had nightmares reading that one. The picture scared me to death! I wasn't expecting it either!! I can tell by the end of the day I will have added a ton of books to my TBR pile!!! Such spooky fun!!!! Love your list!! I need to start alternating my Tuesdays between your meme and Teaser Tuesdays. I love that you included Scary Stories To Tell In The Dark! I forgot all about that one. I TOLD YOU. Isn't that picture terrifying?? And YES, Steve, I did have to include it. It got the most comments and is the reason why those books are scary! :) That was only one of them, too. And I moved it to the last spot because I thought everything else would be anticlimactic. I just finished reading The Replacement, pretty darn creepy. Loved Coraline and Dracula. I had to study Frankenstein in school and I think it kind of ruined it for me. I analysed it to death and now I can't read it anymore! Oh gosh, The Road. So dreary. And I loved Forest of Hands & Teeth. Definitely gave me the "heebie jeebies" too. Sam, I read Frankenstein 3 times in college haha. I'm not sure why I like it so much; probably because the first time we read it I had a really great teacher. I'm doing a series of posts this week on my blog about alternate Halloween books! I'm very much not a fan of scary/horror stories, but I hate feeling left out of the Halloween frenzy. So, I've been brainstorming non-scary but still Halloween-appropriate books to share! I don't really read anything scary, so I'm bowing out of the top ten this week. But I would agree that scary comes in many forms, and Life as We Knew It is definitely a great addition to this list! I probably should read the original Dracula. I didn't know if I could think up ten good Halloween reads, but I did! Love this topic! Christine by Stephen King was my top choice. This is my first time particapating in this. I've been sereaching for a weekly thing to do for my blog, but nothing seemed very good. Then I saw this on a blog and I just have to do it! Hahaha, I love this topic! The Scary Stories to Tell in the Dark books were my favorite in elementary school! Still have that nostalgic love. I haven't read most of your pics yet, but I can see how they'd be creepy. Specially the classics :) Great list! Oops! I thought I was starting a Top Ten Tuesday meme! Oh well -- good idea! You obviously had the idea before me, so I should hop on board. Anyway, for the next few weeks I'm going to post the age-level lists I made, but then it's nice to know I won't run out of ideas for list topics -- I can just join yours! How fun! I made two lists - one for grown-up books and one for kids and teen/Ya books. When I was in a K-6 school library, Scary Stories was one of the most checked out books. I'm in a K-2 library now and I refuse to buy it. Too scary. That picture is truly scary. Thanks for a fun Top 10! Oh my gosh I remember The Bailey School Kids! I read so many of those books! Funny enough, I actually have to read half of Frankenstein for next Tuesday, two days after halloween (I've read it before, though)! I wound up having to add another to my list...I couldn't believe I forgot The Cabinet of Curiosities by Preston & Child. Absolute creepiest book I've ever read! I totally remember those pictures from Scary Stories to Tell in the Dark! Do you remember the poem "There Once Was a Man who Lived in Leeds" that was in one of them? That thing used to give me some serious chills! I had Scary Stories and yes it creeped me out too! LOVED it though. Read it all the time. And YES Dracula! Bram Stoker. No other words are needed. I was so scared of Scary Stories to Tell in the Dark when I was a kid. I just bought my best friend a copy a few years ago and we laughed our way through it. Those were some classics though. I had a lot of fun with this list. Thanks! I posted to join the Tuesday Blog List. How do I get the widget? Thanks. Please help. I'd like to participate this week, but I don't have the icon or know how to get it set up. Thanks. Books for Learning—all you have to do is write up your top ten, copy and past the link into Mr Linky and that's about it. If you can't get the icon that's fine—all I did was save it to my desktop and then embed it using the blogger picture tool.